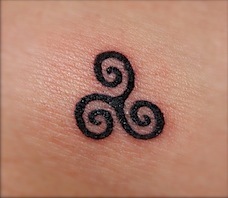 The triskelion has two components: motion and triad attributes. Each component (together and separate) are equally symbolic and powerful. The trkskelion’s branches (or legs) give it the appearance of forward movement. No matter which journey, be it my path forward after my husband’s death or my quest for Boston qualification, this forward motion represents the need for balance, direction, and personal awareness. whatever else comes to mind. Interestingly, once the symbol was chosen, I was ready to have it placed. But I needed to qualify 1st. That was, after all, the plan. Still, there was a point where I felt as if the tattoo itself might be a part of the journey and I nearly made the mistake of putting the cart before the horse. I’m glad that I waited. This is the closest you’ll ever get to seeing it. I think it’s pretty sweet. lol LOVE it! I think it’s simple, beautiful, meaningful, and very, very, sweet. Congrats!! sweet! I’ve been toying with one, but like you, I would want it to not be visible unless I chose to display it. and I’m not sure what it will be yet. When my son’s cross country coach qualified for the olympic marathon trials, he got the olympic rings (5 colors and all) on the outside of his leg (below the hip). You could see it when he ran in short running shorts. Why do I have a feeling we’re not going to find out where yours is?